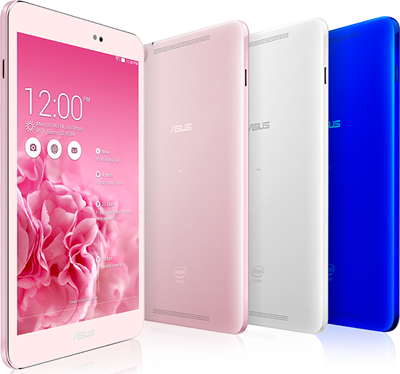 Asus has launched two new tablets in India dubbed Fonepad 7 (FE171CG) and Memo Pad 8 (ME581CL). Both the tablets has been exclusively launched with Flipkart. 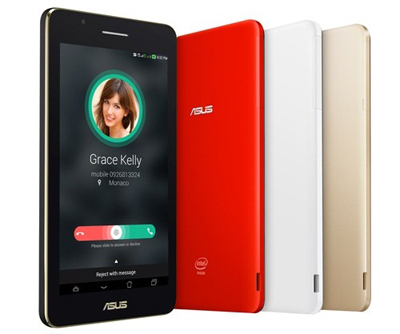 Asus Fonepad 7 (FE171CG) has been priced Rs. 10,999 and the Asus MemoPad (ME581CL) cost Rs. 19,999. Specification feature Dual sim voice calling tablet that runs on Android Kitkat v4.4 with Zen user interface. It feature 7-inch WSVGA IPD Display with pixel resolution of 1024 * 600. It display has been embedded with anti-fingerprint coating with 178 degree wide viewing angle. It has been powered by 1.2-GHz Intel Atom Z2520 processor coupled with 2 GB of RAM. It packs 16 GB of internal storage which can be expanded via. microSD card upto 64 GB. Connectivity includes 3G, Wi-Fi, Bluetooth and GPS. It features sporting camera of 8 MP as secondary camera while 2 MP on front. Battery is of 3950 mAh and measure 110.6 * 196 * 7.9 mm in dimension. It will hit the store with two color variant i.e. White and Black. Memopad 8 was launched in partnership with KIDDI and was announced as “World Lightest 8-inch LTE tablet” by Asus. Specification speaks, 8-inch Full HD IPS display with pixel resolution of 1920 * 1200. For the safety of display, Corning Gorilla Glass 3 protection has been used. It runs on Android Kitkat v4.4 with Latest Zen UI on top. It has been powered by 64-bit Intel Atom Z3580 quad core processor clocked at 2.3 GHz coupled with 2 GB of RAM. It packs 16 GB of internal storage with external microSD card support of 32 GB. Connectivity includes, 4G LTE, Wi-Fi, Bluetooth, GPS and NFC. It features 5 MP camera at back while 1.2 MP camera at front. It has been backed by 4350 mAh battery which is rated to deliver 9 hour of battery life. Both the tablets has been designed for serving computing needs. Tablet are easy to carry and weights 300 grams. Zen UI interface has been pre-loaded in both the tablets to provide users with lighting connectivity and speedy response.